TODAY is my husband’s birthday. That poses more problems that you would think. It’s very hard to buy for him. Why? Because he shops for himself so damn much he has freaking everything. He is a deal-hound with shopping tenacity that beats me down to NO end. FRIDAY, I took the Chaos Elves into a store (this is ill advised) and we picked out several of these *special* workout shirts for him per his very specific instructions. We were in/out in ten minutes. Frickin’ brilliant. A) Yes. 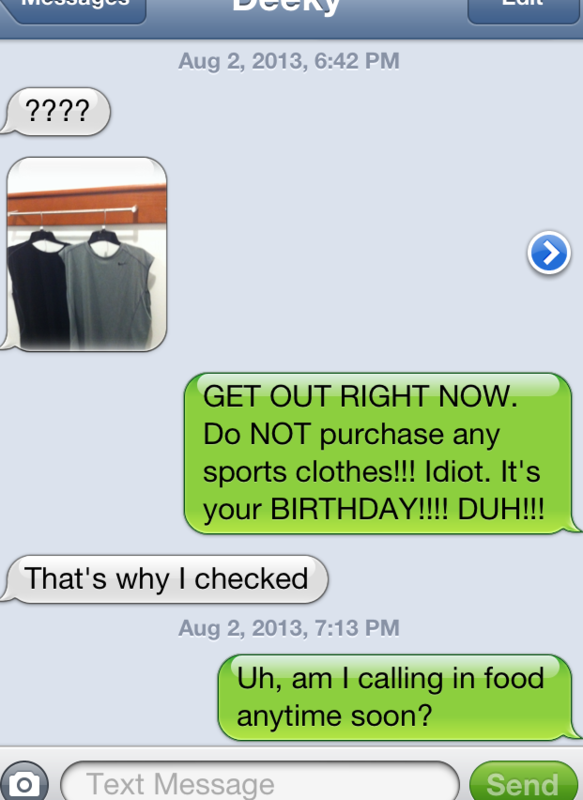 Those shirts he’s asking me about are precisely the ones he told me to buy for him. AND he’s out shopping when he should be home. With food. B) Note that my needs have heavily prioritized to food at this point. C) I am very cranky when I get hungry. D) We have been together 17 years. How has this man not learned when it is time to feed me? E) You’re right, that was a harsh word to say to my husband on his birthday weekend. He’s such a great man, really. Okay, I take back “Duh”. EFF!) It took me 17 times to get this text photo to upload right. I said bad words. I hope I get more tech-savvy soon.